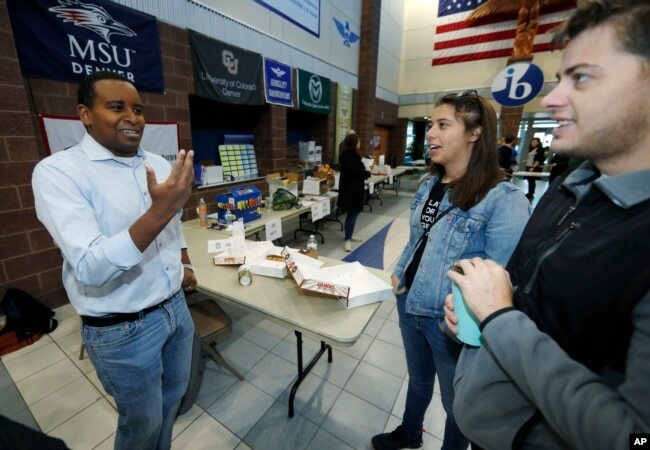 FILE - Joe Neguse, Democratic candidate for U.S. House District 2 in Colorado, greets voters before U.S. Senator Bernie Sanders speaks during a rally with young voters on the campus of the University of Colorado, Oct. 24, 2018, in Boulder, Colo. In 1980, in fear of his life, Debesai Neguse fled Eritrea to seek asylum in America. His wife, Azeib, joined him a year later, and together they rebuilt their lives, 12,000 kilometers from home. When they left Eritrea, in East Africa, a decades-long war for independence from neighboring Ethiopia had devastated the country. The conflict took tens of thousands of lives, depleted the economy and placed the entire nation, and its 6 million people, on a war footing until just this past summer, when a peace deal transpired. On Tuesday, Debesai and Azeib celebrated a milestone in their journey when their son, Joe, became Colorado’s first black congressman and the United States’ first Eritrean-American representative. Democratic candidate Joe Neguse for U.S. House District 2, left, greets canvassers as they head out to round up votes from Hinkley High School, Oct. 20, 2018, in Aurora, Colo.
Neguse, 34, defeated Republican Peter Yu, also a first-generation American, with 60 percent of the vote. Growing up, his parents instilled the importance of hard work, integrity and fairness. It’s those values, he said, that propelled him into a career in politics. 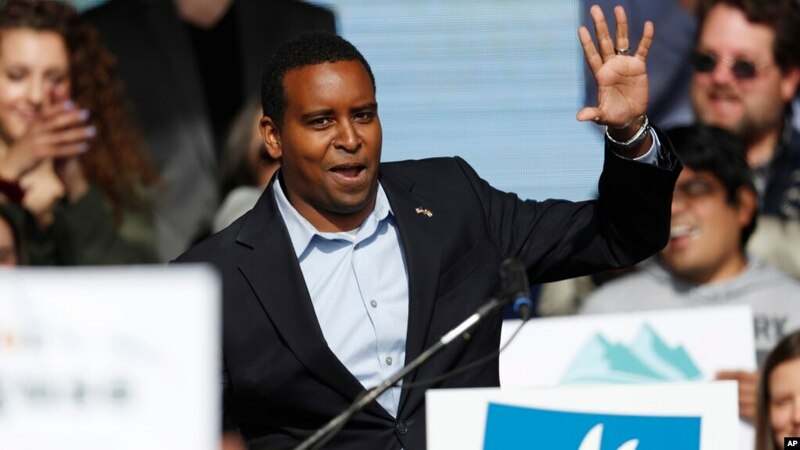 “Over 35 years ago, my parents came to the United States from a small country in East Africa … as immigrants to a country that welcomed them with open arms and tremendous opportunities,” Neguse said in his victory speech. In 2014, Neguse ran, unsuccessfully, to be Colorado’s secretary of state. At the time, he emphasized how his parents’ lives shaped his political aspirations. Neguse, a Democrat, ran in Colorado’s second district and will represent about 720,000 Coloradans in a district that covers about 10 counties. He’ll fill the seat held for nearly a decade by Jared Polis, who will become the state’s next governor. Neguse raised more than $1.2 million for his campaign, compared to Yu’s roughly $66,000. The U.S. Embassy in Asmara, Eritrea, congratulated Neguse in a Facebook post Wednesday. Neguse’s victory will make him one of the youngest members of the 116th U.S. Congress. He’s also a new father. In August, his wife, Andrea, gave birth to their first child, Natalie. When he goes to work for the people of Colorado in January, Neguse hopes to reaffirm the values of diversity and inclusion.